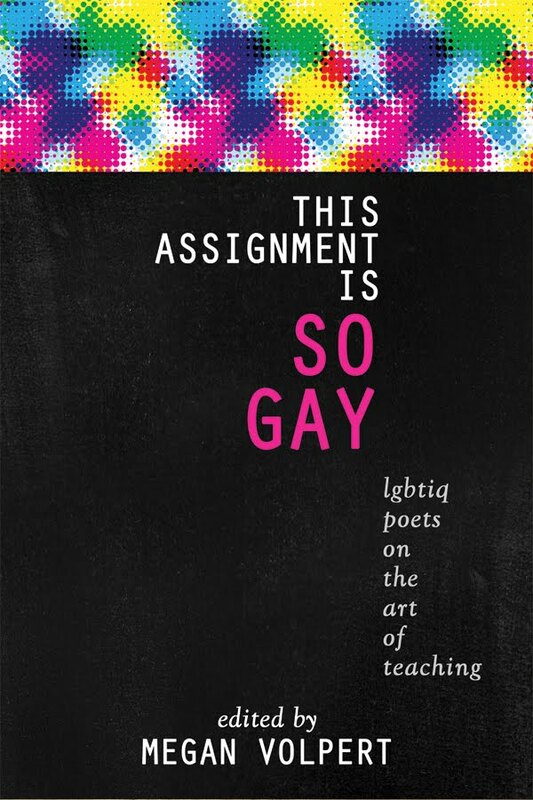 What stands out most about This Assignment Is So Gay: LGBTIQ Poets on the Art of Teaching is the diversity of perspectives, subjects, and, to a lesser degree, forms and styles it contains. An anthology that exceeds 200 pages will, of necessity, contain some variety, especially when each poet contributes three poems at most. In this case, however, variation becomes a stance: the alphabet soup of LGBTIQ cannot be reduced to a single subject or position. The boundaries of queerness are not easy to patrol or to define. But instead the fear rose in me. The speaker’s lesbianism does not disappear in this instant, but neither does it lead her to act any differently than a straight teacher might. The radical possibilities of queerness do not exempt queer teachers from the same kinds of pressures that non-queer teachers face but, in fact, makes these pressures more acute. Any teacher might be accused by a student of behaving in a way that would outrage parents and administrators. Any teacher might thus have her job threatened. For queer teachers, however, such accusations involve their very identities. Any discussion of how to bring the radical possibilities of queerness to bear in the classroom must, therefore, discuss the forces that constrain them; describing these pressures, as This Assignment Is So Gay does, gives such conversations a place to begin without prescribing solutions that might impose limits on queer teaching. By avoiding consistent ideological stances, this anthology resists restraining the possibilities of queer pedagogy. Even the idea that “[o]f course ‘it gets better’” with which Volpert begins her introduction does not always hold true. Insecurity and impostor syndrome recur as themes throughout the anthology, as the titles of Roma Raye’s “Big Fat Faker” and Sarah-Jean Krahn’s “Symptomatology of an Impostor” indicate. Shannon Parker’s untitled poem follows the thoughts of a lesbian teacher who ends up “feeling / like a middle school student / instead of a teacher,” embarrassed and ashamed when she hears students describe her sexuality negatively, while Daniel Gonzales’s untitled piece tells us that “A teacher’s lounge is no different / Than a lunchroom cafeteria / There are cliques and groups and gossip.” Douglas Ray says it directly in “Chaperoning:” “I want to say, ‘It will get better’ / in five minutes, in college, in x or y, but things might not.” Such contradiction strengthens the anthology by emphasizing queerness as a site of multiple experiences and concerns. These concerns are not always obviously related to sexuality or gender. Volpert’s introduction notes that “[n]ot all the poems directly address queer matters, of course, because teachers have many things to do in a day besides pondering their own sexual orientation.” Queer teachers (and students) do not stop being queer because sexuality and gender identity are not part of the lesson plan for that day. A teacher’s identity does not change when, as in Miodrag Kojadinovic’s “A Workday in China,” he asks his students “. . . questions from the textbooks about / drugs and suicides and losing weight.” Such subjects do not necessarily take on a queer flavor simply because the teacher is queer, nor do the poems contained in This Assignment is So Gay, as a whole, take a position as to whether they should. While Ma’ayan’s poem expresses some sense of guilt at not addressing issues of sexuality, Kojadinovic’s does not, even if he doubts the importance of the subjects covered in the required textbook. Such issues remain open for discussion. with their Dale Earnhardt Jr. ballcaps. He wants to protect and fight for his students. By contrast, Ralph Malachowski, in “Adjunctivitis” describes an antagonist relationship with students: “Professor, you find all my mistakes, then mark them wrong. / You’re so mean.” For other teachers, the roles of instructor and learner may be reversed in the way Paulo Freire advocates in Pedagogy of the Oppressed. In “The Introductory Poetry Class Defines Ranchera,” Ruth L. Schwarz records different students’ perspectives and definitions; they make meaning and knowledge together with their teacher. As their teacher makes careful notes of what the students say, instead of lecturing to note-taking students, they trade roles. Finally, the speaker of Megan Volpert’s “This Is Brown Bear Soup” says she teaches like she is “on one of those cop shows where a hardcase joins the force to avenge the fact that his sister was abducted when they were kids.” She will do whatever it takes—and use whatever approaches work—in the classroom. Queer teaching does not imply a single approach or pedagogical ideology any more than it suggests a simple unitary identity. our bodies milky and sallow, freckled and still, wrong. The plainness of these sentences emphasizes that what matters here is the feeling of impostor syndrome, rather than its expression. That this message is sent with form makes it paradoxical, even as it signals the importance of political and social engagement. The diversity of This Assignment is So Gay leaves open the form such engagement should take. This anthology raises more questions about teaching—queer and otherwise—than it answers. Because of this openness, the anthology could be used in the classroom to spur a variety of reflective discussions about education and learning. For this same reason, it also has the potential to ignite a variety of conversations among teachers about pedagogy, identity, and courage in the classroom. Elizabeth Kate Switaj’s first poetry collection, Magdalene & the Mermaids, was published in 2009 by Paper Kite Press. She has also published a chapbook, The Broken Sanctuary: Nature Poems, with Ypolita Press. She is the Assistant Managing Editor of Irish Pages and a doctoral candidate at Queen’s University Belfast. Her website is www.elizabethkateswitaj.net.